3 top 100 - MEDITERRANEO !!! 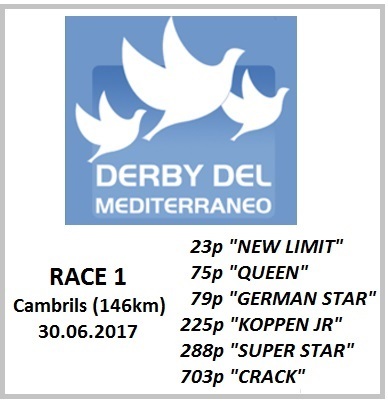 Helgesen Racing Pigeons with nice start of the first official race in Mediterraneo with 3 birds at top 100 (23p-75p-79p). Mother of 23p "New Limit" is direct Nico van Noordenne famous super racers and breeders "No Limit" x "Amazing Suprise". Nico won 1st ACE Pigeon Sprint in the union in 2015 with a half brother "No Limit"
The bird raced 2nd in Algarve Golden Race 2016 Final (505km) was 50% Noordenne and a "Grandson TORERO".